The 533-foot Eclipse at Pier 90 in New York City. Last week, the largest yacht in the world sailed up the Hudson River and docked near midtown Manhattan.The outrageously fancy “Eclipse” belongs to Roman Abramovich, the Russian billionaire who owns Chelsea Football Club. 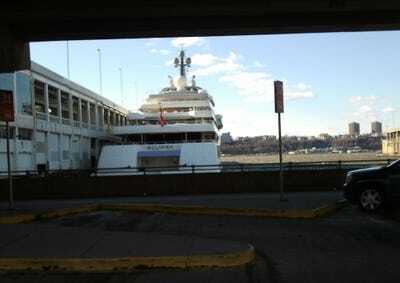 No reason for the Eclipse’s NYC stay, at Pier 90, has been offered by Abramovich or NYCruise, which operates the pier. But it may be about a baby: Abramovich’s girlfriend, Dasha Zhukova, is expecting a child in the Spring, and dock workers have said the yacht is scheduled to stick around until mid-April. NYCruise touts itself as “home to the world’s most spectacular — often fastest, biggest, and most luxurious — cruise ships,” a fitting home for the Eclipse. NYCruise is operated by the New York City Economic Development Corporation, which declined to comment on the Eclipse, and pointed us to David Keller, the President of Trans-Atlantic Agencies. Keller said he could not discuss the arrangement, due to a non-disclosure agreement. 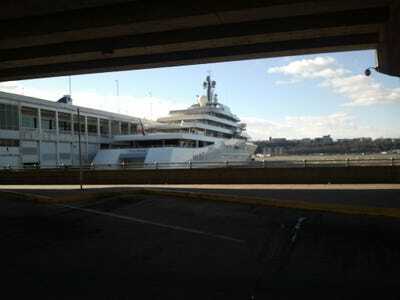 He did note, however, that the Eclipse is docked at the only spot in lower Manhattan big enough to hold her. A security guard at Pier 92, also operated by NYCruise, said the yacht belongs to a Russian named Roman, but offered no other information. 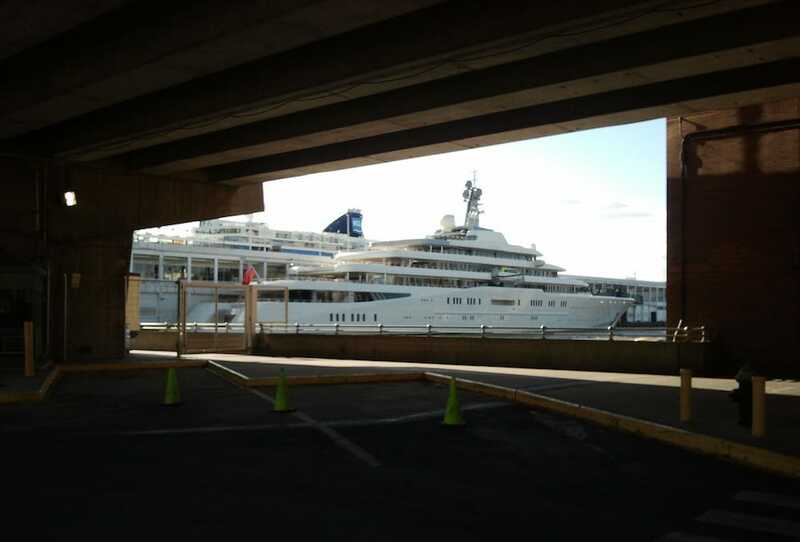 The yacht is in impressive company: Its neighbour is the Norwegian Star, the 965-foot cruise ship. On the other side of the Star is the Intrepid, the retired aircraft carrier turned museum. The 533-foot Eclipse has two swimming pools, two helicopter pads, and a mini-submarine. It is equipped with a missile defence system and bullet-proof windows around Abramovich’s suite, according to the Daily Mail. 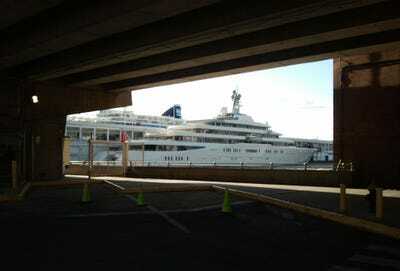 There are 24 guest cabins, and the yacht is kept in order by an enormous, 70-member crew, according to Superyachts.com. 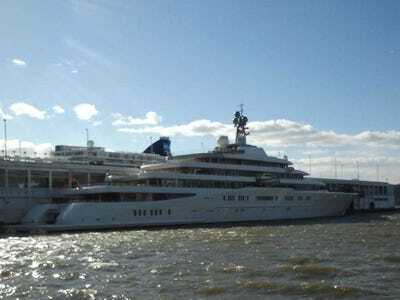 The yacht, built by Blohm + Voss in Germany, was delivered to Abramovich in December 2010, for nearly $1.5 billion, the Daily Mail reported. The Eclipse made port at St George’s Harbour in Bermuda on January 29, the Bermuda Sun reported, and arrived in New York on February 13.